"A real standard in our household -- great for company, and my husband always raves! NOOOOOO preparation (except opening cans!). Cooks all day in the slow cooker, and then YUM! Serve over rice or noodles." 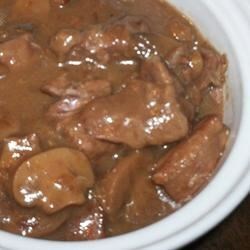 Place beef stew meat, condensed French onion soup, condensed cream of mushroom soup, mushrooms and dry red wine into a slow cooker. Cover and cook on low for 8 hours. A wonderful tender stew! To make a complete meal out of this, I added carrots and potatoes. I also added a packet of Lipton Onion Soup Mix to it.